Jaya Prada had made serious allegations against the senior SP leader Azam Khan, including a claim that he “attempted an acid attack” on her. The duo were part of the Samajwadi Party in 2009. 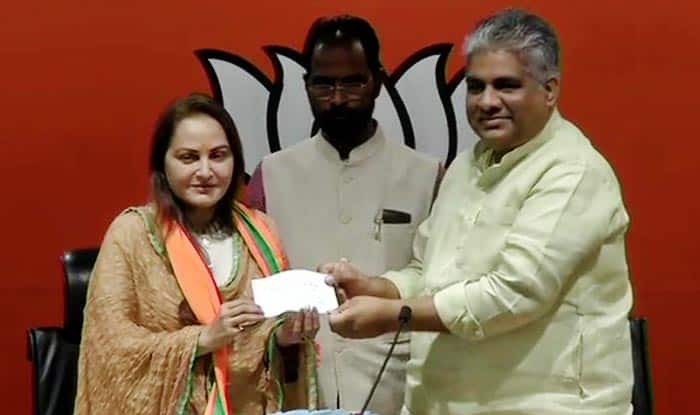 New Delhi: Veteran Bollywood actress Jaya Prada joined the Bharatiya Janata Party (BJP) on Tuesday. Her induction into the ruling party comes weeks ahead of the Lok Sabha election 2019, scheduled to begin from April 11. If reports are to be believed, the BJP has decided to field her from Rampur seat against Samajwadi Party leader Azam Khan. The actress-turned-politician had registered thumping victory in the past from the seat. Both Prada and Khan were part of Samajwadi Party (SP) in 2009. The actress started her political stint with N Chandrababu Naidu’s Telugu Desam Party (TDP) but she quit the TDP following a dispute with the Andhra CM. Later, she joined hands with Samajwadi Party and became MP from Rampur between 2004- 2009. In 2010, she was expelled from the SP, after which she floated Rashtriya Lok Manch along with Amar Singh. In an interview, the actress had admitted that she even contemplated suicide when her morphed pictures went viral on social media. “Amar Singh was on dialysis and my morphed pictures were being circulated in the region. I was crying and saying I don’t want to live anymore, I want to commit suicide. I was going through that trauma and no one supported me,” she had stated.